Vintage kites from all over the world hang from the ceiling and walls of the late Richard Dermer’s popular Hideaway Pizza restaurant in Stillwater, Oklahoma—and that’s only a fraction of his collection. To many locals, the kites might just seem like another piece of quirky décor. But not so. Dermer, who spoke with us before he passed away in March 2014, was an avid kite enthusiast, and each has a personal meaning. 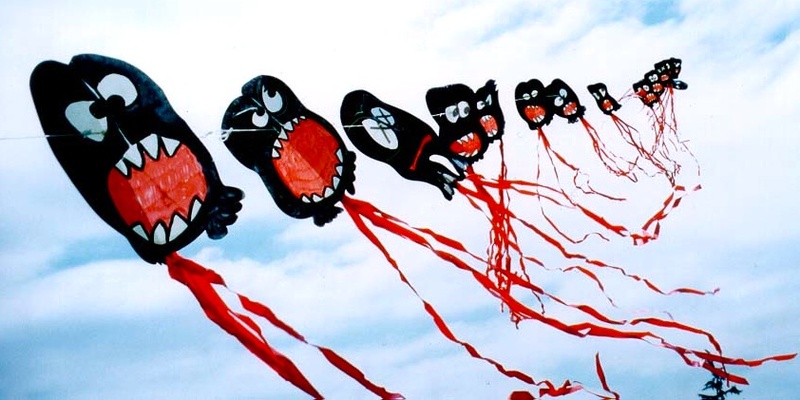 Top: The Piroli Bacteria Kite Train by Japanese kite master Satoru Yamaya. 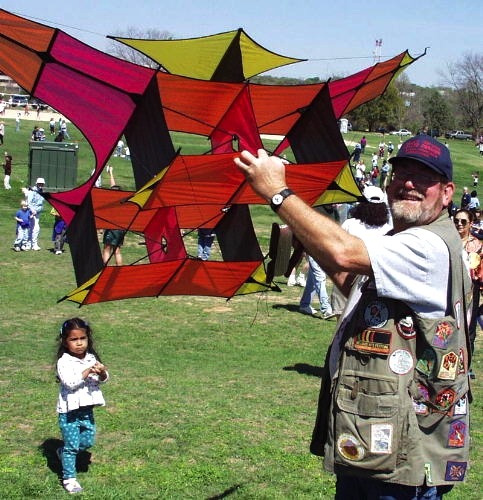 Above: Richard Dermer shows off his replica of a man-lifting Cody War Kite at the oldest kite festival in the U.S., the Zilker Kite Festival in Austin. Via Gomberg Kites. It’s easy to overlook the kites, because the original Hideaway, located across the street from Oklahoma State University, has become a local institution for myriad reasons: The joint introduced the exotic cuisine known as “pizza” to northern Oklahoma in the late 1950s. When Dermer took over in 1960, he encouraged his college-age staff to think creatively. Dermer’s wife, Marti, decorated one wall with a collage from magazines like Life and Oklahoma Today. Then, he purchased a series of cheap Volkswagen Beetles for delivery cars, which he let his staff go crazy painting like Herbie the Love Bug, lady bugs, and psychedelic tie-dye patterns. In the 1970s, Dermer and his Hideaway manager, Gary Gabrel, both chess players, got hooked on playing board games, particularly the Asian game called Go, into the wee hours of the morning. When Gabrel learned a Japanese variation of Go called Ninuki-Renju, he got the idea to market it to the United States, and turned it into a top-selling board game sensation of the late ’70s called Pente. Several copies of the game were placed at the front of the restaurant for customers to play while they waited for pizza. The 1970s board-game sensation Pente, a variation of the Asian game Go, was conceived at the original Hideaway Pizza by manager Gary Gabrel. After establishing a successful game company, Gabrel attended a national toy fair in the early 1980s and returned with a two-string Skynasaur stunt kite. He asked Dermer to fly it with him. That set the Dermers on a journey that led to Richard becoming the longtime regional director and the 1997-1999 president of the American Kitefliers Association, where he helped develop and shape the modern concept of stunt kiting. The couple, who have two sons, have also traveled the world, visiting China, Japan, India, New Zealand, England, France, and Denmark to learn and teach about kites. They often put on educational programs about kites of schoolchildren. And of course, they amassed an international kite collection. A Skynasaur Slicer flies over Roach Lake, Nevada, in 1996. Photo by Hoy Quan/BFK.net. Gabrel, who got the kites wholesale thanks to his toy-industry connections, talked several of their friends into buying and flying Skynasaurs. Then, in summer of 1984, they heard an announcement on KATT 100.5-FM that the Oklahoma City radio station would be sponsoring the state’s first-ever Skydancer Kite Festival, with a stunt-kite competition. 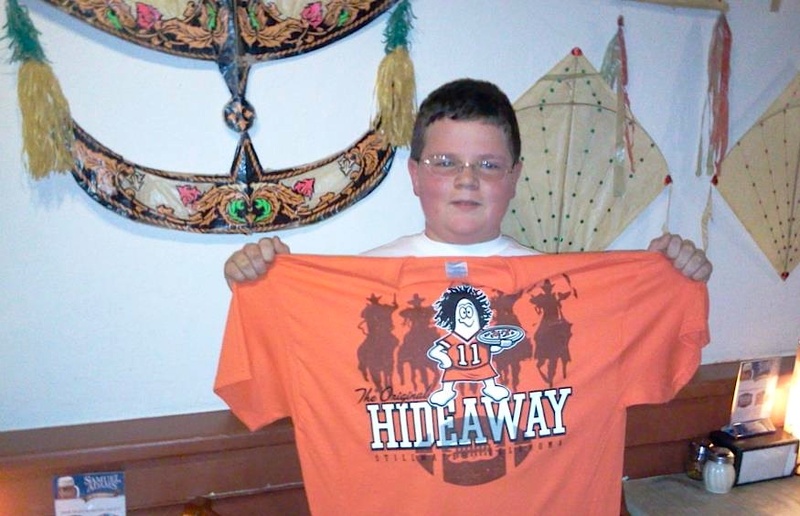 Nash, celebrating his 14th birthday in the Stillwater restaurant in 2011, holds up a Hideaway Pizza T-shirt with an Oklahoma State Cowboys theme. The wall behind him features a “wau bulan” moon kite from Malaysia and two “pakpao” female kites from Thailand. Via the original Hideaway Pizza Facebook page. Afterward, Gabrel put in a call to the Skynasaur headquarters in Colorado and let the company know about their victory. The company offered to foot the hotel bill if the group was willing to represent Skynasaur at the American Kitefliers Association convention in Nashville, Tennessee, the following month. But Dermer and Gabrel met a man at the convention who had been tasked with putting together an American team for the second Weifang International Kite Festival in Weifang, Shandong, China, in April 1985. Richard Dermer asked his wife, Marti, if a trip to China would be a suitable 25th anniversary present, and she said yes. A Malaysian man flies a wau bulan. Via the Textile Institute World Conference. Dermer says that even though the Chinese are credited with inventing kites nearly 3,000 years ago, they were impressed with his Skynasaur, because they’d never seen a maneuverable kite like it before. 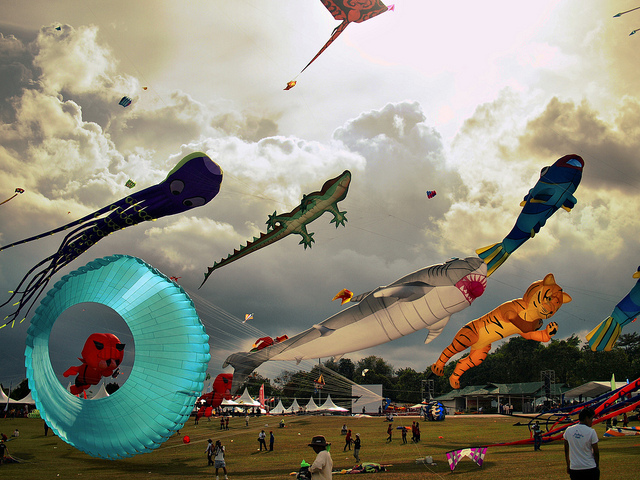 Parafoils shaped like animals seem to leap through the sky at the Pasir Gudang World Kite Festival in Malaysia. 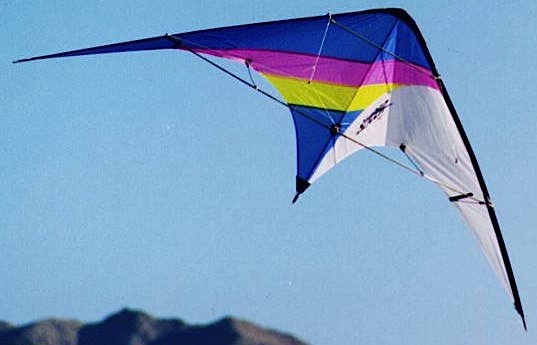 A parafoil, a predecessor to the parachute, is a 3-D kite with no sticks. Photo by Amirul Lazan, via Flickr. Naturally, the Chinese have many legends about kites. 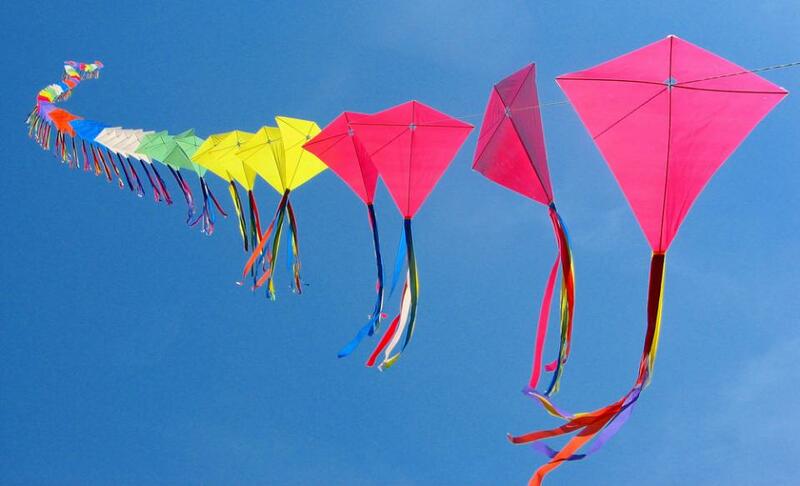 One asserts that around 200 B.C., General Han Hsin of the Han Dynasty used a kite to calculate the distance of a city he wanted to siege. His troops were able to dig a tunnel under the city wall and conquer the town. Other stories tell of man-lifting kites flying over Weifang, which were used to spy during the Warring States period (475 to 221 B.C.). Chinese travelers probably brought the concept of kites to India, and then Indians developed a maneuverable fighter kite, designed to dogfight in the sky. Eventually kite-fighting spread to countries like Afghanistan, Bangladesh, Pakistan, Nepal, Vietnam, Korea, Japan, and Brazil, which each have their own styles of fighter kites and competition rules. 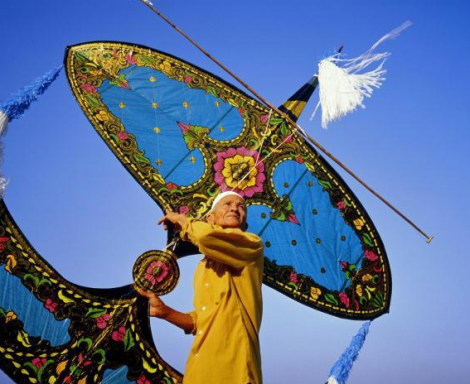 “In the U.S. and in the entire Western world, we think of kite flying as a peaceful, relaxing thing,” he says. “Most of the time, you fly a kite just to have a good time and put a little color to decorate the sky. Not so in India. It’s a fierce, combative sport. Putting a fighter kite in the sky in India is an open invitation to everybody to go get another kite and try and take you down. If there are two in the sky, there’s going to be a battle. Dermer has visited Ahmedabad, India, in January for the country’s Makar Sankranti, the kite-festival holiday that celebrates the beginning of spring. “Gazillions of fighter kites fill up the sky,” Dermer remembers. 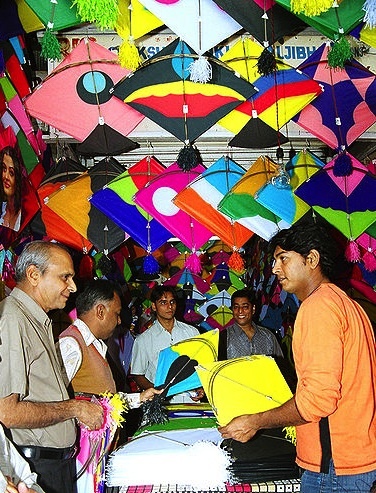 “The kites are made out of tissue paper and bamboo, and they retail at street stalls for 2 cents or 3 cents each. In Ahmedabad, everybody went up on the flat roof of their building first thing in the morning with a boom box for sound, a cooler full of drinks, a hamper full of food, and a box or two or three of stacks and stacks of fighter kites and manja. They would put up the kite and start flying it, and try and cut down their neighbor across the street. 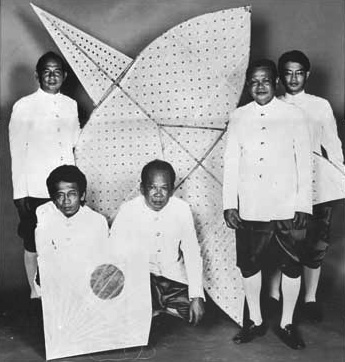 In Thailand, traditional kite fighting has a “war of the sexes” spin: Five to ten men or boys operate one 8½-foot-tall kite shaped like a star known as the male “chula” kite. The chula string has three sets of bamboo barbs meant to catch one or more female “pakpao” kites. The diamond-shaped pakpaos are only 35 inches tall, but each has a long tail and a long loop on their string used to lasso and bring a chula down. Even in the Western world, kites have been used for far more than a serene way to pass the time; they were important tools for scientists. Of course, everyone knows the story of how founding father Benjamin Franklin, in 1750, supposedly used to a kite and a key to prove lightning was made of electricity. 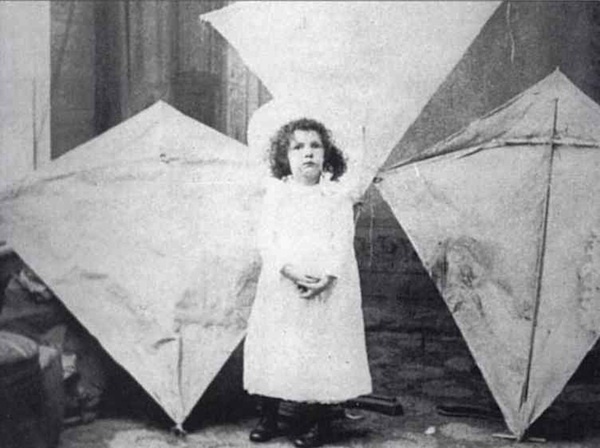 William Eddy’s daughter Margaret poses with her father’s kites in 1895. Photo by William Eddy, via WikiCommons. Kites were also instrumental in the development of aviation technology. In 1883, a meteorologist in England, Douglas Archibald, used a kite to lift a device that measured wind speed. In the United States, inventor William Eddy grew more and more obsessed with how to make the standard diamond kite more stable, so it could fly without a tail and in a chain of kites. The more kites you have on a string, the greater the ability the kite train has to lift heavy objects. Around 1893, Eddy came up with a tailless kite, Dermer explains, that looks like a large diamond kite, but both sticks are the same length. The horizontal stick is placed at 20 percent of the length of the vertical length from the top. That means the kite itself looks nearly flat on top. The horizontal stick is then bowed. 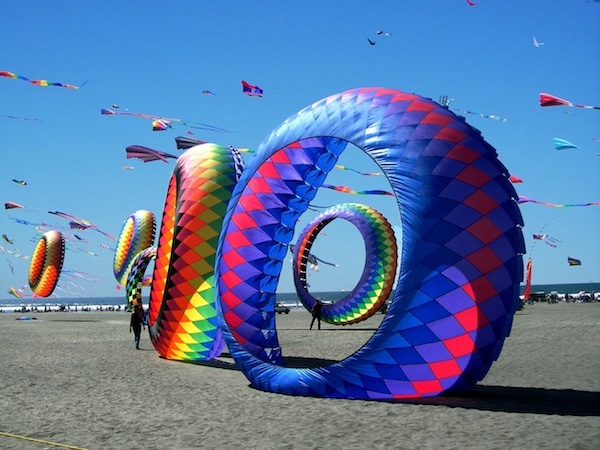 A rainbow-colored kite train. Photo by Rona Proudfoot/Flickr, via TheGauntlet.ca. 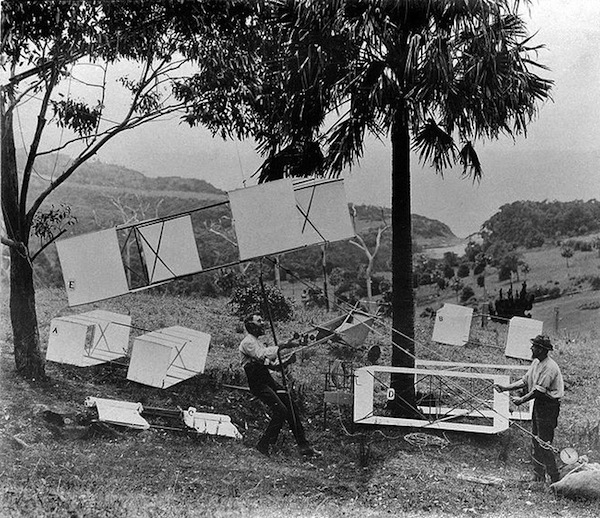 Lawrence Hargrave (seated) and James Swain demonstrate the man-lifting box kites near Stanwell Park beach in November 1894. Photo by Charles Bayliss, via WikiCommons. Still, it wasn’t until Samuel Franklin Cody, an American showman living in England, put two box kites together and added wings to them that the first man-lifting kite was patented in 1901. Samuel Franklin Cody’s man-lifting war kite, photographed in 1908, was used for observation by the British army. Via WikiCommons. Naturally, Cody felt his innovation would be of use to the British military, which hired him to explore the possibilities of using his kites for observation. These devices became known as Cody War Kites (Dermer has a smaller replica of one). In 1906, Cody was put in charge of creating kite sections of the Corps of Royal Engineers of the British Army, and by 1908, he was testing early aeroplanes. By the time World War II broke out, everyone had fighter planes in the sky, but kite technology still proved invaluable to the Allied Forces. 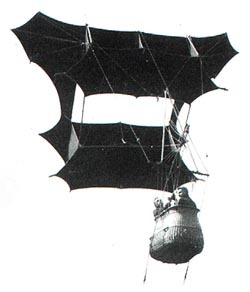 Gibson Girl rescue kites were installed in the life rafts of U.S. military ships, for example. 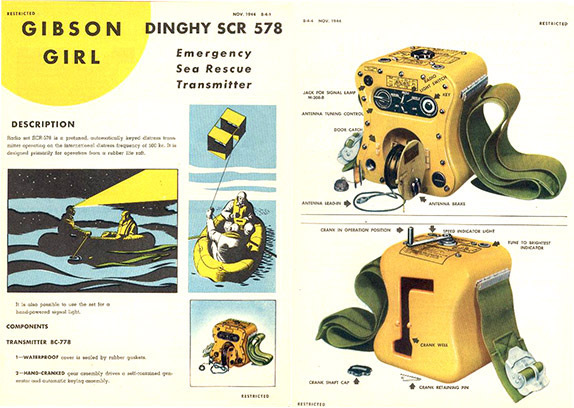 A restricted brochure from 1944 describes how a Gibson Girl Emergency Sea Rescue Transmitter uses a kite to send an SOS signal from a life raft. From the US Army Air Force archives. A young American Naval officer named Paul Garber, who was trying to figure out the best way to train new naval and aircraft gunners, decided a maneuverable two-string Eddy kite would make the perfect target. The Garber Target kits were usually 5 to 7 feet in length, and painted with a silhouette of an enemy plane, like a Japanese Zero or a German Messerschmitt. “The idea was, we can tow it behind the jeep and drive by these gunners, making our kites do figure 8s and loops and dives. They try to shoot it out of the sky, while we try to keep it in one piece,” Dermer says. “The U.S. military shot up tens of thousands of them to train gunners, but they also took them on board ships. A lot of them got saved after the war as souvenirs. I have one of these also. I’d say a Garber target kite in good condition will bring $500 these days at auction or eBay, and poor condition like mine is, a couple hundred dollars. Same thing for the Gibson Girl Rescue kite. During World War II, Navy Commander Paul Garber developed a target kite (bearing the silhouette of a Japanese aircraft) for U.S. Navy gunnery practice. Via the Smithsonian’s Air & Space Museum. 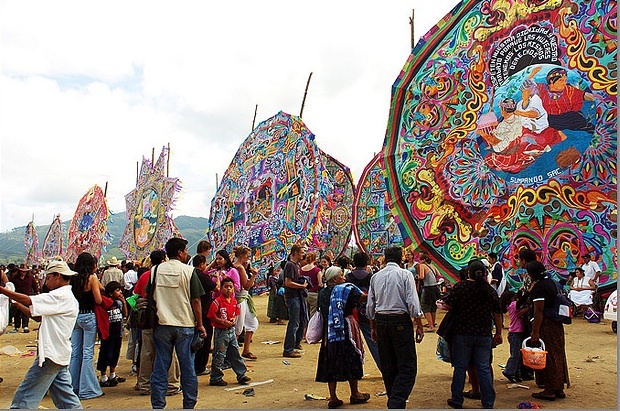 In October, as a way to celebrate the Latin American holiday Dia de Los Muertos, the people of Sampango, Guatemala, build giant kites to honor their dead relatives. Photo by Antonio Lederer, via Creative Commons. As a leader in the American Kitefliers Association, Dermer help set rules for judging and winning stunt-kiting competitions in the sport’s early days. 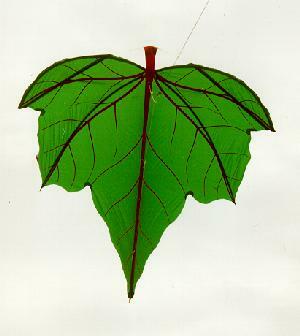 Leaf kites, used in Bali for fishing, are believed to be some of the oldest kites, dating back 2,000 years. Via Kiteman.co.uk. Lately, the Dermers’ particular fascination is miniature kites, and they have several hundred, many of which are displayed in cases at a Hideaway dining room. The couple learned miniature-kite building at a workshop led by a renowned expert named Charlie Sotich. Soon, they were involved with a worldwide community that makes, trades, and collects these tiny kites. “You fly them indoors,” Dermer explains. “You turn off the air conditioner and shut the windows so there’s no breeze in the room. You let the kite dangle from your hand on 2 or 3 feet of sewing thread, and you start walking. A gentle walk provides enough breeze for a miniature kite to swing up and fly about 2 feet above your head. 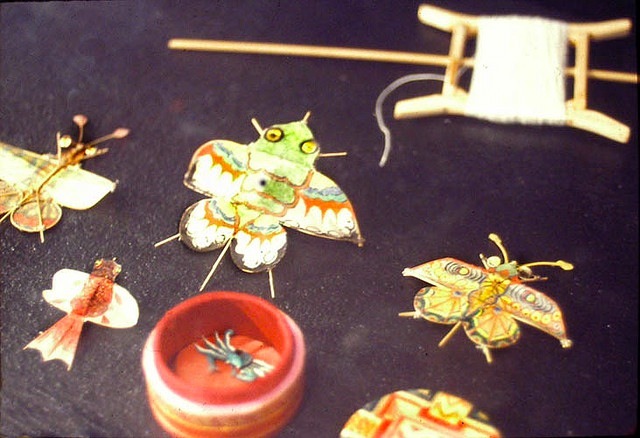 Here are some examples of Chinese miniature kites. The red box, which is the size of a quarter, holds a micro crab kite. Photo by George Peters, via Gallery O. Besides attending kite festivals, putting on educational programs for schoolchildren, and keeping the kite displays at the Hideaway, the Dermers find clever ways to spread kite love wherever they go. oh wow! I wanna make kites for a living! I want to quit my job and make kites. I live near the beach in Florida, why am I working in an office. I could be making kites! I used to make kites when I was a kid, I can make better kites now! Sigh! Thank you Mr. Dermer, you have done extrodinary things promoting kites . You have made a difference, be proud of your accomplishments . The kiting community salutes you. 1 year in kites for me and one of my best a lot of nice people I have had a kite in air with and Richard one of the many. Outstanding article. I have been flying kites all my life but really got into them when I lived in West Texas just out of college in the early 90’s. I was very fortunate to get to know Richard and Marti and many other wonderful, intelligent, colorful people in the kite-flying community. It was always a lot of fun traveling to the nearby kite festivals and moving up through the ranks of competitive sport kite flying. I also learned how to kite buggy and kite surf which has become very popular. Richard helped inspire me to learn how to sew and make my own kites. Reading this brought back a lot of great memories. I will definitely be flying some kites this weekend when I visit Panama City Beach, Florida. I hope everyone who is able can put a kite up in the air very soon. Congratulations a great article and thank you for all your contributions to the to our American Kite Fliers Association at the kite world! If any readers want to get involved in the wide and wonderful world of kites just visit the American Kite Fliers Association link at the end or the article. This article is great! Back in 1999 I visited a kite shop in Monterey California purchased my first kite and was hooked. I remember the first kite festival I attended and how seeing all of those kites in the sky blew me away! Over the years I educated myself in the hobby and have met so many wonderful people in the process! I enjoy sharing my passion of kiting with others and seeing the smile on their faces! One day while on the beach flying my inflatables a woman lay down on the sand and used her purse as a pillow. I saw her staring up at the kites and smiling! After about an hour she got up and said thanks I had a rough day and this helped me relax! I was flying with the kites! “ ” We had Eames furniture, of course. Who didn’t?